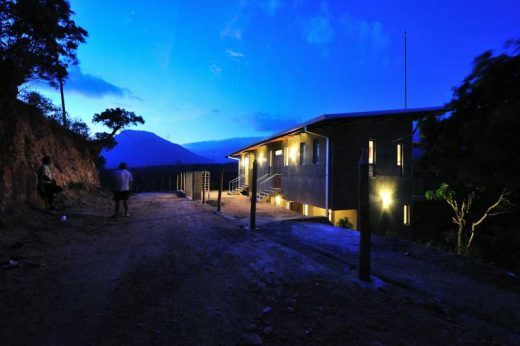 A retirement home designed and supervised by Chinthaka Wickramage Associates in the Belihuloya Mountains of Sri Lanka for Wind Power Engineer Mr. Sunith Fernando and his medical professor wife. “The rapid growth of Asian cities and the accompanying problems of increased density, traffic congestion and pollution have seen the proliferation of parallel phenomenon-second homes. When city dwellers have sufficient means to escape the frenetic pace of life in the city they acquire a site some distance from the city, to build a second home. Preferably the site will be off the beaten track, yet accessible, and though somewhat isolated, not without basic services. It offers the opportunity to escape the stress of city life, to relax, to enjoy the natural environment”. This retirement home was designed as a ‘discreet hideaway look-out’ for clients who wanted to spend there retirement in quite solitude amongst the mountains. The house was built on stilts avoiding expensive retaining wall foundation systems to keep costs down as this was to be there second house. The House was built on stilts on reinforced concrete column and beam structure with upper level out of ‘Teak’ timber deck and Lower level out of ‘NERD’ pre cast slab system to minimize the load on the RCC Column & Beam structural skeleton. Projecting from the Upper Level and overlooking the valley is an outdoor balcony protected by a cantilevering reinforced concrete canopy. The house is located on hillside and traverses the contours before balconies cantilever out at the northern extremity. Access to the house is from the upper level of the site via a set of steps on the southern flank. The house is entered at the highest level of the site, directly from the street, thus permitting some interaction between public and private spaces. Roof was mono pitched corrugated non asbestos roofing sheets, opening out to the distant mountain views with generous eaves. This substantially sloping roof has wide projecting eaves in order to shed the monsoon rains. Ceiling was out of silver painted cement boards on exposed neatly planed and polished timber rafters mimicking ‘metallic’ ceilings. Exterior walls were painted with a special paint mix of rubberized glue and cement, later hand cut using sand paper and sealed with a clear coat of sealer, so that the finished colour a gray with a greenish tint will ‘blend and merge’ with the surrounding upcountry dry zone vegetation. Internal finishes are inexpensive and hard wearing –polished cement on the lower level and local hardwood timber on the upper level. The more ‘modern’ materials such as Natural anodized aluminium glazed door windows were used as a contrast to more traditional cement grey walls with hot dipped galvanized steel upright handrails providing protection to balcony ‘lookouts’ wrapping the house on ‘view’ side. Electricity is supplied from the national grid with overhead cables from a substation few kilometers away, while sewage goes into an underground septic tank. The technology is minimal, based on instinct and experience rather than mathematical formulae. The orientation of the house is ideal because the long elevations face north and south and consequently the architect did not have to deal with direct sunlight in the morning and evening. The building section takes precedence over the plan as the generator of building form and the basis of design thinking in this steeply sloping site. It successfully employs the principal of composing tropical houses from one room wide rectangular blocks. Exterior colours were carefully selected to merge with the surrounding greenery – “an ‘unfinished’ modern architecture that readily accepts a patina of age”. There is duality in the house plan: the south facing entrance elevation is relatively closed, with small window openings, whereas the northern façade is open with larger windows looking towards the valley and the mountain range. The narrowness of the one room wide plan also helps in this respect; by opening windows on the north and south elevations, through drafts are encouraged. Forested hills form backdrops to almost every ‘view’ from balconies. The house which is built on hillside attempts to exploit the topography to create an imaginative section. “The result is a dark alien presence of a house in the landscape in grey green cement, aluminium and glass. It is a modern take on a jungle hut in a thickly forested valley. Life is reduced to the essentials, and not withstanding the use of modern technology it is very much in the spirit of a traditional dwelling. The house has a special relationship with nature. Substantially isolated in a cleft in the terrain, deep silence reigns in the night, broken only by the sound of water tumbling over rocks and tree roots from the nearby ‘Hirikatu -Oya’ Stream. At night the house is magical. In the deep blackness, one sleeps surrounded by the sound of insects. Urbanized man is never far from his primitive origins. And that is the beauty of this abode; it is at one with and coexists with nature”. This House is photographed by Archt. Waruna Gomis and Chinthaka Wickramge.